It’s hard not to fall in love with the beads and sequins on these gowns! Below you’ll find some of our favorite beaded gowns in a variety of styles and silhouettes. Enjoy! This hand-beaded gown from Justin Alexander is sure to impress! The fitted silhouette and deep V in the front and back make for a truly sleek and sultry look. This tulle ball gown from Casablanca Bridal is a favorite! We just love the gorgeous beading along the hem. Looking for something extravagantly elegant? Then this gown by couture designer Anny Lin might be for you! This light champagne gown has a heavily beaded bodice and gorgeous beading along the skirt and train. Hoping for a beaded look with sleeves? Then you’re going to love this gown from Casablanca Bridal. If you’re set on a fitted, then this beaded lace and tulle fit and flare gown by Justin Alexander could be the perfect look! The beaded illusion back as well as the beaded scalloped hem make for a very glamorous look. Want a gown with all-over beading? Then look no further than this look from Anny Lin. This silk chiffon dress is covered with delicate lace and pearl beading, and has a stunning illusion back design. Behind the Scenes at Sealed With A Kiss: Off To Bridal Market We Go! New York Bridal Market is this weekend, and for those of you not familiar with what this is, here’s the rundown: designers release their new lines of wedding gowns and buyers and bridal shop owners line up to see and choose which designers and dresses they’ll want to carry in their shop. Sounds simple right? Well, it’s actually a lot of work. Dozens of runway shows are going on at any given time and they’re often spread all about the city, making it difficult to see more than a handful of collections. That’s why before we even get to market we have to decide which designers and collections we most want to see during the few days we’re there. This is especially difficult, because we want to choose designers who not only design high quality gowns, but who will be good to work with and willing to make changes to their designs to meet the needs of our brides. Every bride has her own unique style and we need to be able to cater to whatever that style may be. That’s why we select a variety of collections, offering styles that range from flowy and romantic destination gowns to beaded and elegant ball gowns. We do our best to choose designers who are willing to alter their designs, as well as designers who offer accessories like belts and detachable sleeves that enable a bride to make the gown a direct reflection of her own style. We also have to consider how much our brides are willing to spend on their wedding gowns. While we might love a certain designer’s collections and think they’re a great company to work with, we have to consider whether or not the prices of their gowns will be within reach for the majority of our brides. We do our best to meet the needs of brides with any size budget, so we can’t go working solely with designers whose gowns are over $5000. We therefore make a point of selecting designers and collections that we know will provide high quality gowns at a range of prices. 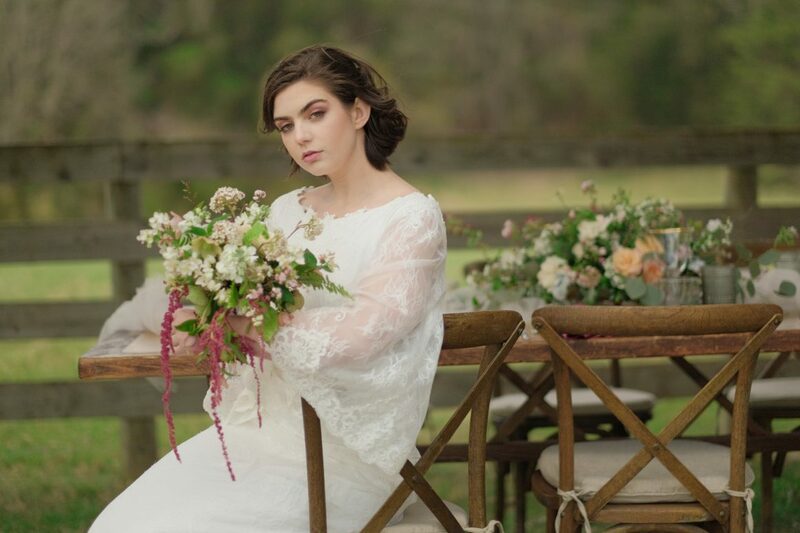 Keeping all this in mind, what we’ll be doing this weekend is carefully selecting which designers to see during market and then select the gowns from their line that we believe are best suited for the brides who come to our store. It’s bound to be stressful but this is one of our favorite parts of the job. The dresses we buy at market likely won’t hit our stores until the late summer and fall, but once they do finally arrive we love to see how happy our brides are with our selection–that makes all the stress worth it! Our bridal market adventures begin tomorrow, so be sure to follow our blog and our Instagram (@sealedwithakisscville) to see what we’re up to! If you love gowns with pretty details and movement, then a wedding gown with a layered skirt might be for you! Below, check out some of our favorite layered skirt styles by the designers we carry. The layers on the skirt of this pink ball gown from Sincerity Bridal are subtle but beautiful! A bride looking for a style that is both romantic and fun is sure to fall in love with this dress. Love the layered skirt but looking for a more fitted look? Then say hello to this fit and flare style from Augusta Jones! Looking for a layered look that’s a little more airy? Then this Lillian West style may be for you! Perfect for a garden wedding. This elegant Justin Alexander ball gown proves that layered skirts can be sophisticated. Maybe you want a style that’s a little more fun and flirty? Then you might like this look from Sweetheart Gowns! This blush colored couture design by Anny Lin Bridal has one of our favorite layered skirts! Each layer of Swiss Dot tulle has a gorgeous lace edge with sequins. Looking for something with all-over lace? This gown by Augusta Jones features gorgeous lace layers.